Friday, 3/27, we took the RV back to Beaudry for a new holding tank. While out of the house, we utilized the Tucson Passport coupon book given to us by the St. Angelos. You get two for one admissions with it. 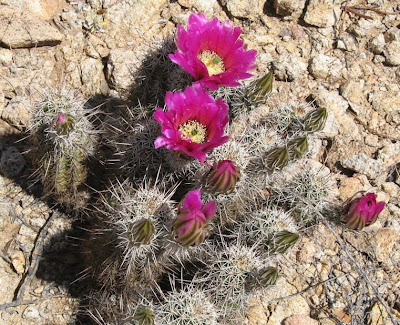 Our first stop was the Tucson Botanical Garden, which we would give a "meh" rating. These are yuccas. The flower spikes are just amazing. Like orchids, only better. One of the outdoor garden rooms. Then it was on to the Reid Park Zoo. It's not a huge zoo, but it's a nice one. Here is an African elephant, playing with food. This enclosure sort of reminded me of the Peaceable Kingdom. There were also a bunch of Guinea fowl running around honking at the ostrich. The peacocks get to roam about at will. This is one of the few animals collected from the wild at the zoo. They have had him for about 30 years, he weighs 500 pounds. His age is not known. The Russian river otters are hoping for food. There was a zoo worker standing by the fence holding a metal pan. They were were really hoping that a snack would be coming their way, but there was no joy. So, it was back to swimming for them. The blue and gold did not seem to be eating any of the corn, he was just shredding it. The local birds would dash in and carry away the corn kernels. The military next to him was grousing constantly. I think he wanted the corn. He eventually gave up and got an apple, which he proceeded to shred. Large fish from the Amazon. The weekend was uneventful. We rode the bikes, went out to breakfast Sunday at the Rincon Market. No good blog material presented itself. Today was tax day. Since the wind is blowing again, we decided we would get the dang taxes finished. Federal is no big deal, since I used H&R Block software, but I'm too cheap to buy the package for NC, so Jim got to do it. It's very interesting just how arcane state income taxes are. We got used to not dealing with that while living in the GPNW. This will be the last time for us, as we are now South Dakota residents. So, we are still here, with completed tax forms. Sunday (3.22) was the last big breakfast ride to the Rincon market. The raft is breaking up and people are starting the great migration elsewhere. It's like being the last kid at summer camp, everybody's gone! Tuesday Jim and I rode out to Saguaro East on the Aviation bike trail. It's a pleasant ride. Most of the route is either trail or low traffic roads. We came back across Park on the Basket Bridge. It has a really cushy spongy surface, so much so that when I was getting back on the bike I thought I had a flat. Wednesday was a hike up to Starr Pass. The ocatillo flowers are out. They're very vibrant. The beauty of cactus blossoms is amazing. You have this spiny alien looking plant producing such beautiful flowers. I like them a lot. This plant is called a fairy duster. This is a nice example of one, it's cultivated. This hasn't bloomed yet, I like the purple and green. I don't know if this plant is native to AZ or not, it does bloom nicely. This is funny. 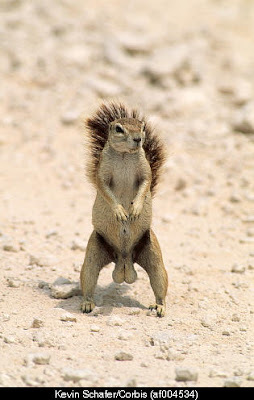 When we ride out to Saguaro East we go by colonies of Arizona round tailed squirrels. They dig tunnels and engage in turf battles with each other. 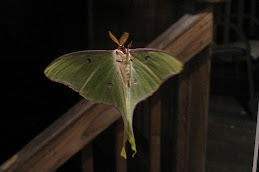 They are just cuter than bugs, and I have yet to get a decent picture of one. I was out on Google images looking for a photo and I found this. He's a different species from up around the Grand Canyon, the caption referred to him as a "well nourished" specimen. 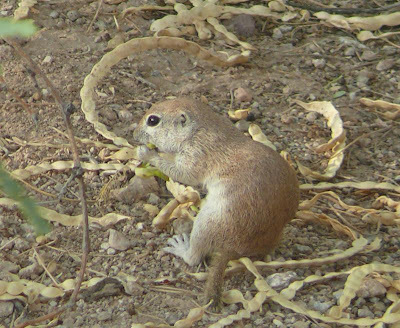 This is the round tailed ground squirrel. So, we're here until April 23, then it's off into the great wide open. There will be more cactus pictures as they continue to bloom. Kim&Jim will be here first week in April so maybe you'll be treated to photos of a tourist attraction or two. Today it's blowing like stink, and the inside of the RV is all covered with dust. Tomorrow we're hitching her up and taking the RV back to Beaudry for the new holding tank. Happy I will be to get that behind us. This cactus in the RV park blooms like a champ every year. It's really pretty. This weekend is the 4th Avenue Street Fair. We went today, Saturday. It's way more crowded than the winter fair. I don't even want to know what they're doing in this booth. This booth is the temple of meat. We think this young woman won the outfit of the day award. Ok, maybe this one. It's a furry suit. There were many fortune tellers out on the side walks. We're seeing more of these motorized bicycles. We never see their riders wearing helmets. We think the yellow thing is the motor, and the gas tank is in the pannier. So that's it for today. Tomorrow we're riding unless it's blowing the dog off the chain. When we go online, each of us is our own editor, our own gatekeeper. We select the kind of news and opinions that we care most about. Nicholas Negroponte of M.I.T. has called this emerging news product The Daily Me. And if that’s the trend, God save us from ourselves. That’s because there’s pretty good evidence that we generally don’t truly want good information — but rather information that confirms our prejudices. We may believe intellectually in the clash of opinions, but in practice we like to embed ourselves in the reassuring womb of an echo chamber. Wednesday saw us heading south to an undisclosed location in Lacey. We had time, so we took a tour of Tacoma. Tacoma is about 35 miles south of Seattle, and has always been the much less appreciated cousin. Jokes about the Aroma of Tacoma have persisted for years, due to a pulp mill on Commencement Bay that used to really stink. Now it just stinks a little. There has been an effort recently towards civic improvement, they have put in a linear park along the water that is quite nice, and Chihuly glass abounds in the city. This is Tacoma from the freeway. Two roll on-roll off Navy ships. They are here in Tacoma to load Stryker and other armored vehicles from Fort Lewis and transport them to Iraq and/or Afghanistan. There used to be a huge Asarco copper smelting plant on Commencement Bay. It, and the really tall stack are now gone. I believe the area was a superfund clean up site. Now, like so much of America, the land is being given over to condos. This is the road into the area, bet they're going to have to widen, or improve or something. The Tacoma yacht club. The pointy roofed buildings are boat houses. This is Stadium high school. It's 100 years old, it's just an amazing building. 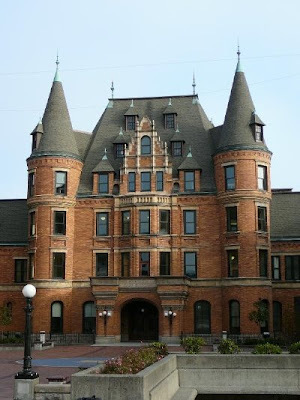 In the same area as Stadium high school, we have the homes of the original wealthy people in Tacoma. They're up on a ridge overlooking the water. I can see why they wanted to live there. We think this is the old City hall. Now we're back in Bellevue, where the frenetic pace of construction continues. This just tickles me to death. First there was luxury, then there was affordable luxury, then it was green design, now it's eco-luxury living. What does that mean? Gold plated worm bins? We're just astounded at the number of housing units that are going up (no pun intended) in the area. I'm not sure where all of those people are going to work. So we're back in Tucson. We got out of Jim E's car last night (he picked us up at the airport, thank you Jim!) and were greeted with warm gentle breezes and the smell of rib eye steaks on the grill. Not our grill, unfortunately, but the ambiance was truly wonderful. Today we're kind of tired, so we're going to grocery shop and do about 50 pounds of laundry generated in the GPNW. We are glad to be home.